MP Moran can offer you the option of applying for a CREDIT ACCOUNT. Once set up, your account will be assigned with a credit limit and any purchases you make will be itemised on your account statement which is sent to your business address monthly for payment. 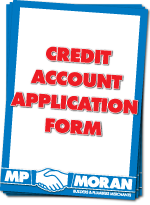 To apply for a credit account, download and complete an application form and send it along with copies of your last 3 months Bank Statments, photo ID (Passport or Drivers Licence) and a Company Letterhead to your local MP Moran branch. To open a TRADE CARD account, simply download and complete the application form, then post it, fax it or drop it in to your local MP Moran branch.